In the previous post, I suggested some ways to use items from IKEA in my teaching. Storage, cushions and soft shoes were all mentioned. This post focuses on items to enhance and facilitate speaking and listening in PLL. One of the main obstacles I find in getting pupils to speak Spanish (or French, German, or any other language) is the 'hang up' that it sounds funny. Whilst this is not such a big problem, in my experience, in PLL, there is still some reticence on the part of some pupils to speaking the foreign language. Using puppets is one way of getting around this. Puppets come in all shapes and sizes - you can download patterns for card finger puppets here and here: you can use sock puppets - see Jo Rhys-Jones' video in which pupils converse using their alien sock puppets; you can use glove puppets - I have a HUGE collection of those (including Ana and Jaime); and you can use finger puppets. 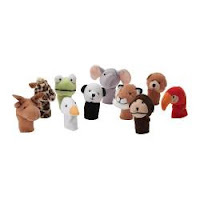 As well as charity shops , jumble sales and my childrens' toyboxes, IKEA are the m ain source of my finger puppets. 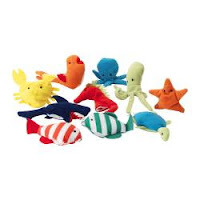 TITTA are sets of 10 finger puppets, costing £5. I have three sets (about time they brought out a new set!) - a sea set (right), a fairytale /royal court set (not pictured) and a jungle set (left). Pupils prefer the animals and give them names and different voices. By using the puppets they are distancing the 'funny noise' that some of them associate with speaking Spanish etc and displacing it onto the puppet. Using silly voices is another useful ploy - and is encouraged - as long as the voice doesn't make understanding impossible! Additionally, puppets seem to increase confidence and encourage creativity in a way that 'turn to your partner and practice the phrases' doesn't. Not hard to see why when you're dealing with kids who associate role play with using props and dressing up and having fun. 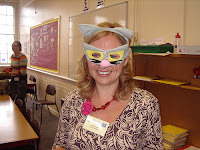 If you were at the IoW conference in October, or even read about it, you may have seen a picture of me as a cat! For the benefit of those who haven't, here it is! Well today, I made another discovery - more masks and this time not just animals! An alien with antennae, a flower, a spider, a princess, a dinosaur, a ladybird and a bumblebee form the latest set of play masks. This time I managed to find two 'willing' volunteers to model them for me (although I didn't completely escape as you can see!). As well as using these masks for the activities mentioned above, I'd like to use them to encourage pupils to be creative and make up their own (simple) stories that they can act for one another. You'll notice that some of the pictures are framed by a green and blue 'stage'. Today IKEA were selling puppet theatres for 49p - made of cardboard admittedly but nonetheless worth a small investment! As demonstrated by my 'dos voluntarios', they can be used as a stage for conversations using the masks, and would work equally well with finger, sock or stick puppets. Can't wait to have a go in the classroom! But until then, I know two people who'll be having fun giving me more ideas! The Ikea finger puppets are great. I've used them in Primary Science for classification - describe your animal and then in groups make a key to identify them.